PharmaFluor PFA fittings are designed for handling corrosive or ultra-pure fluids in applications where contamination is a concern. Constructed of 100% virgin PFA, PharmaFluor PFA fittings combine high purity with the robust performance of compression-style fittings. PharmaFluor PFA fittings are easy to use and need no special tools for installation. Designed for a variety of fluid handling applications, PFA fittings are ideal for gas or pneumatic conditions in applications that do not require flared connections. PharmaFluor PFA fittings are designed to work with PharmFluor FEP tubing. 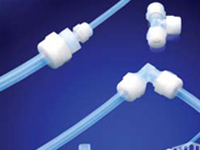 To further discuss the PharmaFluor® PFA fittings, and how we can help you. Please contact us, or request a callback at a convenient time to suit you.